October 23, 2013, 12:15 PM · It's about time that Robert Schumann's Violin Concerto had its day. Composed 150 years ago, just before Schumann's suicide attempt and descent into madness, its dedicatee, Joseph Joachim, apparently associated the piece with his friend's tragic unraveling. To that end, he hid it away in a Berlin library and pronounced it should not be published or played until 100 years after Schumann's death in 1856. It was resurrected briefly in the 1930s but still not fully embraced. 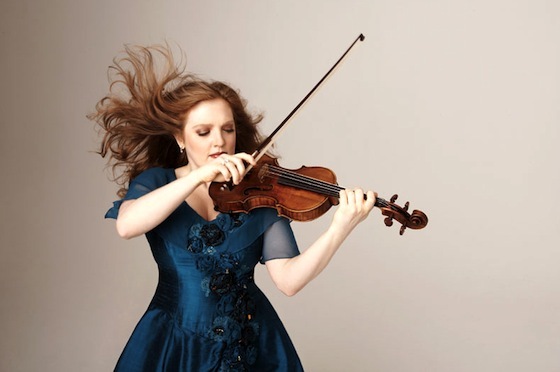 Violinist Rachel Barton Pine has just released a new recording of the work, paired with the Mendelssohn Concerto. Intellectually, she argues that the Schumann concerto should be part of the canon, neither rejected as problematic nor worshipped as a lost masterpiece. Musically, the argument she makes with conductor Christoph-Mathias Mueller and the Germany-based Göttinger Symphonie Orchester takes the piece to a level of comfort and precision that brings out the music's drama, drive, originality and heart. Rachel is not the only one to embrace the Schumann Violin Concerto in recent years; the piece is clearly growing in popularity, evidenced by recordings by Renaud Capucon in 2004; Joshua Bell in 1996; Christian Tetzlaff in 2011; Elmar Oliveira in April 2013 and Baiba Skride just last month. For Rachel, the true moment was when she played the piece in live concert in 2010. Laurie: Tell me about the concert in 2010, with Christoph-Mathias Mueller and his orchestra that inspired this recording. What made the experience such a revelation for you? Rachel: With some composers' music, you can have an amateur orchestra play it through or professionals sight-read it, and it works. Then with other composers, you really need to mold and shape every phrase. There's nothing lesser about one or the other kinds of music, but some composers are one way and some are the other way. As we all know from Schumann's symphonies, this is the kind of music that needs careful crafting. The same is also true of Schumann's violin concerto; if the accompaniment is played like it's just accompaniment, the piece falls a little flat. If you take a more symphonic approach, if you work to mold the orchestra part with all the phrases and with all the timing, then suddenly it comes to life. The solo part can just kind of sit on top of it. That's what Maestro Mueller did, and it was a revelation. It made me feel excited about the piece -- I was determined to record it, and to record it with him! Laurie: Isn't he the one who suggested that you play the Schumann in the first place? Rachel: Exactly, he had first gotten to know me as a violinist through my recording of the Brahms and Joachim concertos and subsequently invited me to perform the Joachim concerto with an orchestra. He eventually asked me to come back with the Schumann because he felt like, based on my playing of Brahms and Joachim, that I would bring something that he knew he would like to the Schumann. I'd never really given that piece much thought; I think I was a little bit influenced by the melodrama of its unfortunate history. When it was written, Schumann was already beginning his decline into mental illness, and Joseph Joachim, the great violinist for whom it was written, was emotionally affected by that tragedy. He couldn't help but associate this piece with Schumann's struggles. So he said the piece was flawed, and he dismissed it. It was neglected for about 80 years, and in the late 1930s it was championed by Yehudi Menuhin and some other violinists. In fact, it was really hyped at that time as a newly discovered masterpiece. Then it didn't quite live up to the hype, and people concluded that it's actually not good. So this pendulum has been swinging back and forth: is it an unworthy piece, or is it a great piece? I think the answer is that it is neither. The best analogy is the Dvorak Violin Concerto. No one says it's as good as the Dvorak Cello Concerto, and no one says it's as good as the Brahms Violin Concerto. But everybody agrees that it's a perfectly wonderful piece that we all love to play and hear. Interestingly, Joachim also rejected the Dvorak Violin Concerto. It was written for him and he was supposed to premiere it, but he thought that it was a problematic piece. We definitely revere Joachim for his musical taste: Joachim championed the Beethoven concerto when it was lying neglected; he insisted that music should be played without superficial flash. Joachim was the very first violinist to insist that the Bach Sonatas and Partitas were not compositional exercises or study pieces, but that they could be enjoyed in performance as great and moving concert works. Joachim was the first artist who insisted that the late Beethoven quartets were things that audiences could understand and grow to appreciate and love. So Joachim's musical taste was almost impeccable, but nobody is infallible. He made a mistake in the case of the Dvorak, and he made another mistake in the case of the Schumann. There's one other thing, though, that the Schumann Violin Concerto needed. One reason why some people would say it's flawed is that the solo violin part is, in essence, not finished. It's really Schumann's first draft. Why? Because most composers who are not violinists themselves, after they write a violin concerto, they then begin a collaborative process together with their violinist dedicatee. That's where revisions are made, where idiomatic revisions are suggested by the violinist, and so on. So Joachim never got to do this with Schumann because of Schumann's health, and he didn't want to do this in the absence of Schumann's approval. So it never got done. In the time since then, everybody has been so respectful of Schumann that they try to play the bowings and the notes as Schumann wrote them. After all, that is what you're supposed to do with works of great composers. Yet, because this was the draft, not the final version, in a way, I think that's almost less respectful because you're not honoring the music. Take, for example, the last movement. If you play what's on the page, it can't be played, except at a slightly slower tempo, which then makes the music feel stodgy. But by reworking some of the double stops, by cutting a few notes of certain runs here and there, the essence is still retained and yet the music can suddenly flow along, dance, come to life, and have that Polonaise feel that it really needs. So I was guided by the principle of "WWJD" -- "What would Joachim do?" -- and was quite liberal in terms of my modifications. Each modification itself was as conservative as possible, but I was quite liberal in how many I made. I felt like that was the right thing to do; it just made the music feel like it fit now. Laurie: Was there any movement that needed more modification than others? You spoke of the last movement. Rachel: Yes, the last movement was the most highly problematic; once these modifications had been made, the entire tempo was able to be changed. In the first movement, it was more about just being able to have the musical line and the character. The effect of certain passages worked better with some changed bowings and voicings. The slow (second) movement needed very little modification at all. It's such a beautiful melody, so relaxed and soothing. Laurie: Yes, but I took a close listen to that second movement, and it seems very rhythmically complex. Rachel: It is! The opening melody is a solo played by the principal cellist, and it's entirely on the offbeat, which is very unusual. Very creative idea. There are so many interesting things about these concerto, it really bears further study by anybody who hasn't given it more than a passing glance, as I once hadn't. Laurie: Are you planning to make your revisions available to people? Rachel: I've been pondering what do to about not only the Schumann, but about my editing of a number of violin concertos. For example, the five Mozart Concertos, which I just recorded with my own cadenzas with Sir Neville Marriner and The Academy of St. Martin in the Fields, an album that will be out in the spring. But also, Brahms, Tchaikovsky, Beethoven, Sibelius…These days, a lot of people go online to free download sites and get any old edition. Or, if we're more studious, we want to get an urtext edition that's a completely clean edition. But what does one do, now, about the value of having an edited edition available for students or young professionals who might want to see exactly what bowing and fingerings I'm using? Of course, you ought to make your own decisions in the end, but if people want to study the ideas I've come up with, as part of their interpretational process, I would like to make these available to people. Perhaps I'll publish just the solo violin part, maybe as a collection. We shall see! Laurie: Did Maestro Mueller have to make a lot of revisions to the orchestra part in order to make this concerto work? Rachel: Some dynamic balances, some bowing, but mostly it was a question of timing and inflection. For example, the basic underlying rhythm of the accompaniment part of the Rondo section, the opening theme of the last movement can sound very square and sort of lead-footed. But if you sort of aim toward that middle beat with a little lift and almost delay the last beat with a little bit of lightness, suddenly it's dancing along. It's the exact same notes; you haven't changed the rhythm, you haven't changed anything except the feel. It's kind of like a Viennese waltz -- I'm not saying it's the same feel, but in the same way that you can play a waltz beat underneath a waltz melody and have it just be totally square and blah, or you can play it the right way. Laurie: If it was Mueller who suggested the Schumann to you, where did he get the idea? Rachel: One of the reasons I like hanging out with Christoph Mueller is he's just as much of a repertoire-collecting geek as I am; he's always looking for interesting and unusual things. I'll mention to him the Villa-Lobos Sonata No. 3 and he'll say, 'Oh, have you heard Villa-Lobos' never-played violin concerto? I've got an archival recording of someone's live performance of it over here,' and he'll dig out some recording -- it's great, we could just hang out for days, going back and forth like that! Laurie: Let's turn a little bit to the Mendelssohn. I heard a few articulations in there that I don't always hear, and I wondered if you were going for a more classical approach. Rachel: Actually about 10 years ago, I crystalized my approach as being early Romantic, which is kind of a fuzzy grey area. Because Mendelssohn should not be played like Mozart, but it also, to me, doesn't feel right to play it like the Bruch G minor Concerto. So often one hears it played more like it's a mid-Romantic concerto. I decided to use a tone color palette that was more pure. When you listen to my album, you can hear the contrast between the tone of the Mendelssohn and the robustness of my tone on the Schumann. So I'm still using plenty of rubato in a very Romantic way, but having a cleanliness of shifting, not a lot of expressive slides, not a lot of schmaltziness or gushiness. I also chose tempos that are a little more flowing; to me that really felt right. Of course, it can be done in a bajillion different ways, and I love to listen to pieces played in ways that I would never play them. Take, for example, that wonderful DVD, The Art of the Violin, where they spliced between people's Mendelssohns -- they were all so different and yet equally as effective as one another. But the way that feels right to me to play the Mendelssohn is definitely this early Romantic approach, finding that happy middle ground. Ever since I hit upon that about a decade ago, I've been working to hone and refine that approach. Of course one aspires to continue to improve one's understanding of these concertos for the rest of one's life, but I felt like I was satisfied and happy enough with how my Mendelssohn was sounding that it was time to share with the public on an album and preserve it for posterity. It's a real thrill to be able to do that. Laurie: Did you have to work with the orchestra to make that approach the same as yours? Rachel: Being in Europe, they are definitely used to playing in a variety of historically-informed styles, not to the degree of Baroque bows and gut strings, but when they play Haydn they play it like Haydn, they don't play it like it's Mahler. So once I told them what I wanted, they knew what I meant. Laurie And what did you want? Rachel For example, in the first tutti in the Mendelssohn, which is right after the conclusion of first solo section with those notorious octaves: violinists usually round out the slurs, probably because they are used to playing the solo part. They bow it with the same smooth slurs as in the first entrance of the solo violinist. Rachel: But in fact, Mendelssohn has a completely different bowing, and I rarely hear orchestras do it; I always ask them to, but it's actually supposed to be down-bow for the first three beats and up-bow on every fourth beat. Rachel: And even here, (m. 58-59 and like measures) you can't get the same effect with a slur or a hook. Even if you tried to articulate the hook, you wouldn't get that 'dom, de-domp domp dom,' which I think is genius. It's taking the exact same music and totally transforming it. So if you try to make it match, it's wrong! It does sound more like one foot is still in classicism when you do that original bowing. That's the bowing that Mendelssohn wrote, so why in the heck wouldn't you do it? It was little things like that, and we were definitely on the same page; it was just finding that way to blend our style and make it all hang together. And I'm just so pleased with how it came out, it was everything I was envisioning.